This GIF is lagging, for better viewing I suggest you to check the Demo application. The CharmNotification is a component that allows you to create customized notifications that slide from the right to the left side of the bottom-right side of the screen. Thanks to this component you'll be able to customize the colors,icon...etc of your notification or you can simply create new ones at the Run-Time (as presented above). Why don't I create a free component that does the same thing? BackColor1 ; The color of the left side of the notification. BackColor2 ; The color of the right side of the notification. Title ; The title of the notification. Text ; The text of the notification. TitleForeColor ; The color of title of the notification. Icon ; The icon the notification. Duration ; The duration of the notification (1000 = 1 second). PlayTone ; The notification will play a tone if this bool will be set true. 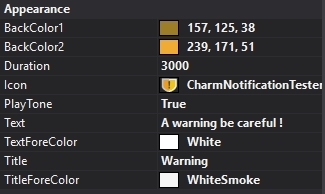 CharmNotification usage is made to be as easy as possible, however, you can manipulate it with codes or using the designer. That's all of it folks ! Sometimes you must relay on the simplest stuff to create the most complicated things. I am a 19 years old software developer & a university student. I am a curious person, I love learning about new things and meeting more experienced developers & engineers. Thank you so much for sharing this pretty control! Good work. Easy 5. Thanks for sharing. You could get the correct screen to use by Screen.PrimaryScreen instead of just using Screen in the Styler_Tick in the NotificationHost Control. Or the Calling Form gets the Screen it´s on right now with Screen.FromControl(...) and passes it to the NotificationHost. But even if you´d set it to the correct monitor it wouldn´t be usable right now. You´d see it moving from the right screen onto the left screen. So you´d also need some logic to resize the Notification Host, so only the left part is seen as it moves to the left.